Pet Champion 18-in Stake, 25-ft Cable, Medium Tie-Out, Cable Spiral Stake Set:,Stronger, lighter cable,Dog tie-out stake is for dogs up to 60 pounds,Vinyl-covered cable,Allows you to take your dog wherever you and your family go,Safely keep your family dog in your own yard with this Pet Champion Dog Tie-Out Cable and Stake Set. 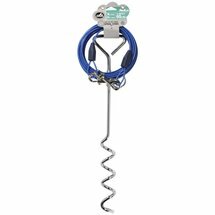 It includes a sturdy and durable, 18 corkscrew stake and a generous, 25' vinyl-covered cable. Designed for pooches up to 60 lbs, this tie-out cable for dogs and spiral stake set is easy to install and disassemble, allowing you to take it wherever you go for added convenience.